Not sure where to place this. 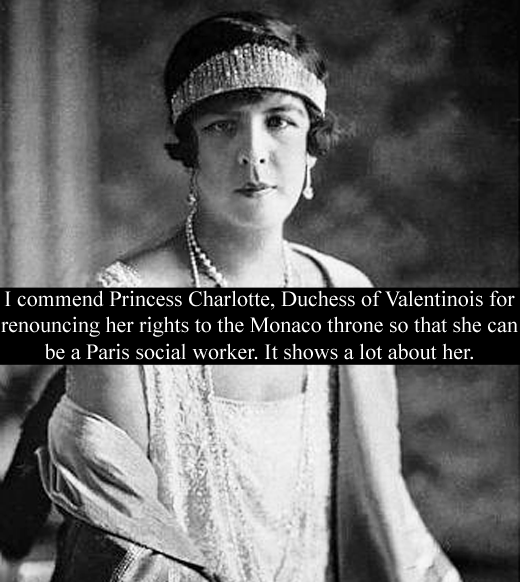 "..On 30 May 1944, the day before her son's 21st birthday and in full agreement with her father, Charlotte renounced and ceded her rights to the throne to her son Rainier, subject to the stipulation that he did not predecease her. From this date she was no longer Hereditary Princess of Monaco, though she retained the titles of Princess of Monaco and Duchess of Valentinois. Late in life she went to college, obtaining a degree in social work. After her son assumed the throne, Princess Charlotte moved to live at Le Marchais, the Grimaldi estate outside of Paris. Despite the objections of her children who feared for her safety, she turned the estate into a rehabilitation centre for ex-convicts. She lived at the estate with her lover, a noted French former jewel thief named René Girier and nicknamed "René la Canne" (René the Cane). In 1977, Princess Charlotte died in Paris, France. Caroline looks just like her. Princess Gabriella rules the world! Princess Gabriella doesn't have time for Monaco's outdated succession law! Remember the cover of "Hola! (Mexico) with Charlene on the cover wearing a tiara? Here there are more pics. 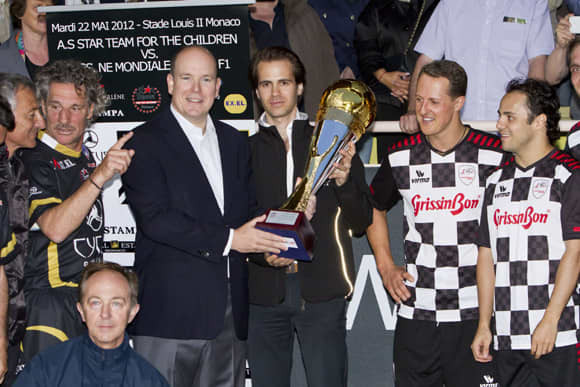 As she congratulated the participants of a charity football match, Princess Charlene lingered over one special player. Prince Albert of Monaco's stylish wife looked particularly pleased to see Formula 1 ace Michael Schumacher. She chatted warmly with the racing driver, who gave her a kiss on the cheek. He seemed to be admiring her jacket, which was printed with images of spectators watching the Monaco Grand Prix. As a former Olympic swimmer, Charlene no doubt welcomed the chance to converse with a fellow sports figure. What on earth is that jacket? It's the sort of thing that would be cute in theory but kind of tacky in reality.